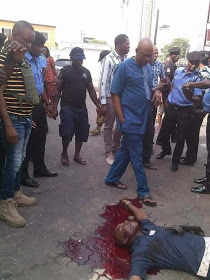 A four-man armed robbery gang on Wednesday, February, 22, stormed Zenith Bank branch along Wetheral road Owerri, Imo state capital, injuring three police men and five bank customers. 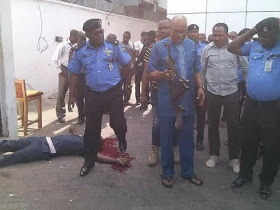 One of the armed robbers (pictured on the ground) was gunned down. However, reports by eyewitnesses said three people died in the attack. According to Ifeanyi Njoku, it gathered that the four armed robbery gang arrived the bank with an ash colour Toyota Camry. Eyewitnesses were skeptical about the success of the gang in carting away money as action of policemen attached to the bank who swiftly responded by gunning down one of the gang foiled the successful operation by the robbers. The Spokesperson of the Imo State Police Command, Mr Andrew Enwerem, who confirmed the incident, said that the arrival of security operatives at about 1510hrs, on getting a distress call that the bank was under attack. 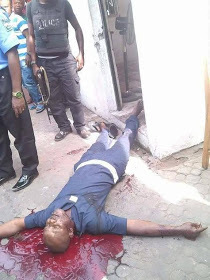 The command were said to have mobilised their men, a combined team of Police led by the Commissioner of Police, CP Taiwo Lakanu, and other detectives to the scene that prevented the armed robbers from stealing money. “On Arrival, the operatives engaged the four armed robbers that arrived the bank with an ash colour Toyota Camry in a shoot out. 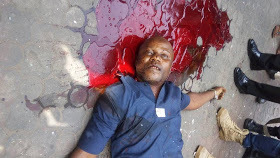 At the end of the shoot out, three Police men sustained various degrees of gun shot injuries”. the PPRO said. “One of the armed robbers was short dead and one AK47 Rifle with 100 rds of Ammunition that was earlier snatched from a policeman on 24/11/2016 was recovered from the dead Armed robber with three magazines.” he added. “Others robbers escaped with serious gun shot injuries and the the wounded Policemen are receiving treatment in the hospital. Police operatives is intensifying patrols for the arrest of the fleeing robbers. The robbers could not gain entrance into the banking hall following the swift response of Police operatives”. he concluded.